Adler Group | Future is solar. Let ADLER Group help you touch the future. You are here: Home / Solar Energy / Future is solar. Let ADLER Group help you touch the future. While our recent look at residential solar may lead you to believe harnessing that power is a newer initiative, humans have been exploiting solar energy for thousands of years to heat their homes, cook, and produce hot water. Some of the earliest written references to technology consciously designed to capture the Sun’s rays come from ancient Greece. Socrates himself said, “in houses that look toward the south, the sun penetrates the portico in winter, while in summer the path of the sun is right over our heads and above the roof, so that there is shade.” He is describing how Greek architecture exploited the different paths of the Sun through the sky at different times of the year. By the fifth century BCE, the Greeks were struggling with an energy crisis. Their predominant fuel, charcoal from trees, was scarce since they had stripped their forests in order to cook and heat their houses. Wood and charcoal were rationed, and olive groves needed protection from the citizenry. The Greeks addressed their energy shortage by carefully planning the layout of their cities to ensure that each house could take advantage of the sunshine in the way Socrates described. The combination of technology and enlightened government policy worked, and a crisis was avoided. Technologies for harnessing the thermal energy in sunlight have only continued to grow over time. Colonists in New England borrowed the ancient Greek homebuilding techniques to keep warm in the harsh winters. Simple passive solar water heaters, little more than a black-painted barrel, were sold commercially in the United States in the late 19th century. And more elaborate solar heating systems were developed to pipe water through absorbing and/or focusing panels. The hot water is stored in an insulated tank until needed. In climates subject to freezing, a two-fluid system is used, where the Sun heats a water/antifreeze mixture that passes through coils embedded in the storage tank, which does double-duty as a heat exchanger. These days, a variety of sophisticated commercial systems are available for water and space heating in the home. Solar thermal systems are deployed throughout the world, with the largest installed base per capita found in Austria, Cyprus, and Israel. But modern solar truly starts in 1954 with the discovery of a practical way to make electricity from light: Bell Labs uncovered the fact that silicon could make a photovoltaic material. This finding created the foundation for today’s solar cells (essentially the devices converting light energy into electricity) and ushered in a new era of solar power. Aided by intense research ever since, it’s an era that continues today as solar appears poised to become the dominant source of power in the future. The most common type of solar cell is a semiconductor device made from silicon—a cousin of the solid-state diode. 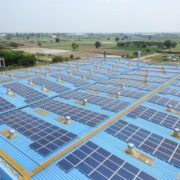 The familiar solar panels are made from a number of solar cells wired together to create the desired output voltage and current. Those cells are surrounded by a protective package and topped with a glass window. Solar cells generate electrical power using the photovoltaic effect, a fact that didn’t come from Bell Labs. Instead, this was first discovered in 1839 by French physicist Alexandre-Edmond Becquerel (son of physicist Antoine Cesar Becquerel and father of physics Nobelist Henri Becquerel, the discoverer of radioactivity). A little more than a century later, Bell Labs had its solar cell breakthrough, providing the foundation of the most common solar cells. In the language of solid state physics, a solar cell is formed from a p-n junction in a silicon crystal. The junction is made by “doping” different areas of the crystal with small amounts of different impurities; the interface between these regions is the junction. The n side is a conductor with electrons as the carriers of current, and the p side has “holes,” or areas with missing electrons that act as current carriers within the crystal. In the region near the interface, the diffusion of charges creates a local “built-in voltage” across the interface. When a photon enters the crystal, if it has enough energy, it may dislodge an electron from an atom, creating a new electron-hole pair. The newly freed electrons are attracted to the holes on the other side of the junction, but they are prevented from crossing it due to the built-in voltage. However, if a pathway is provided through an external circuit, the electrons can travel through it and light our homes along the way. When they reach the other side, they recombine with the holes. This process can continue as long as the Sun continues to shine. The energy required to transform a bound electron into a free one is called the “band gap.” It’s the key to understanding why photovoltaic (PV) cells have an intrinsic limit on efficiency. The band gap is a fixed property of the crystal material and its dopants. Those dopants are adjusted so that solar cells have a band gap close to the energy of a photon in the visible region of the spectrum. This is a practical choice, because visible light isn’t absorbed by the atmosphere (phrased differently, we humans have evolved to see in the most common wavelengths). Photons come in fixed amounts of energy, which means their energy is quantized. That also means a photon with energy less than the band gap (say, one in the infrared part of the spectrum) won’t create a charge carrier. It will simply heat the panel. Two infrared photons together will do no better, even if their combined energy would be enough to bridge the gap. A photon with excess energy (an ultraviolet photon, for example) will knock an electron loose, but the excess energy will also be wasted. Since efficiency is defined as the ratio of light energy striking the panel divided by electrical energy extracted—and since much of this light energy will necessarily be wasted—the efficiency can not be 100 percent. The band gap of a silicon PV solar cell is 1.1 electron volts (eV). As can be seen from the diagram of the electromagnetic spectrum reproduced here, the visible spectrum lies just above this, so visible light of any color will produce electrical power. But this also means that for each photon absorbed, excess energy is wasted and converted into heat. The upshot is that even if the PV panel is flawlessly manufactured and conditions are ideal, the theoretical maximum efficiency is about 33 percent. 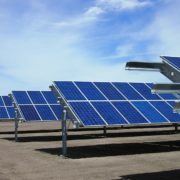 Commercially available solar panels typically achieve about 20 percent efficiency. 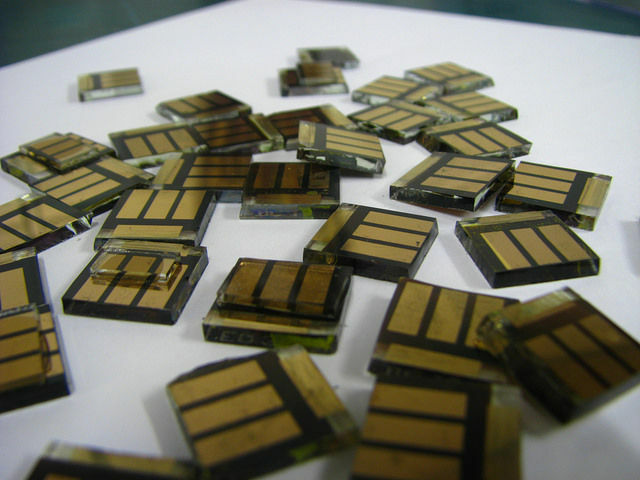 Most of the solar panels commercially deployed are made from the silicon cells described above. But research into other materials and strategies is underway in laboratories around the world. Some of the most promising recent research for silicon alternatives has involved materials called perovskites. The mineral perovskite (CaTiO3) was named in 1839 in honor of Count Lev Aleksevich Perovski (1792-1856), a Russian mineralogist. It can be found on every continent and in the clouds of at least one exoplanet. The word “perovskite” is also used for synthetic compounds that have the same orthorhombic crystal structure as the naturally occurring mineral (or a closely related one) and share a structurally similar chemical formula. Depending on which elements are used, perovskites can display a wide variety of useful properties, such as superconductivity, giant magnetoresistance, and photovoltaic activity. 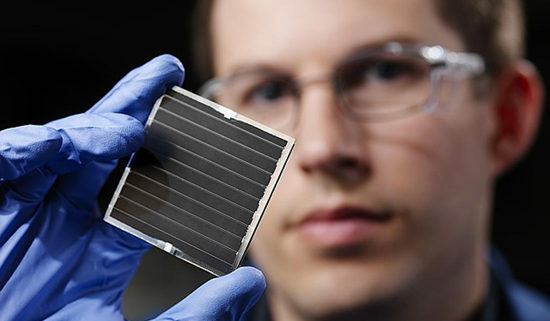 Their use in PV cells has generated a great deal of optimism, as they have shown an unprecedented increase in efficiency from 3.8 percent to 20.1 percent in the past seven years of laboratory research. This rapid rate of progress inspires confidence that further gains are likely, especially as the factors limiting efficiency are becoming clearer. Recent experiments at Los Alamos showed that solar cells made from certain perovskites attained efficiencies similar to silicon’s, while potentially being cheaper and easier to work with. The secret to perovskite’s appeal is the ability to routinely grow defect-free crystals of millimeter-scale in a thin film. This is a huge size for a perfect crystal lattice, which allows the conduction electron to travel through the crystal without interference. This crystal quality partly compensates for the somewhat less-than-ideal band gap of about 1.4 eV, compared with silicon’s nearly optimal 1.1 eV. Much of the research directed toward increasing the efficiency of perovskite cells involves searching for ways to eliminate as many crystal defects as possible. The ultimate goal is to manufacture an entire cell’s perovskite layer in the form of a perfect crystal lattice. Researchers at MIT have recently made significant progress on this. They have discovered how to “heal” the defects in a film made from particular perovskites by exposing it to intense light. The advantage over previously devised methods of defect removal, involving chemical baths or electrical current, is that no physical contact with the film is required. Whether or not perovskites will lead to revolutions in solar panel cost or aggregate efficiency is still unknown. While they’re easy to make, so far most perovskites decompose rapidly, which sharply limits their utility. Research is underway in many places to attack the decomposition problem. A collaboration between scientists in China and Switzerland invented a novel way to form perovskite cells that obviates the need for hole motion (see above). Since the layer devoted to hole conduction is susceptible to degradation, the material will be far more stable once that layer can be eliminated. 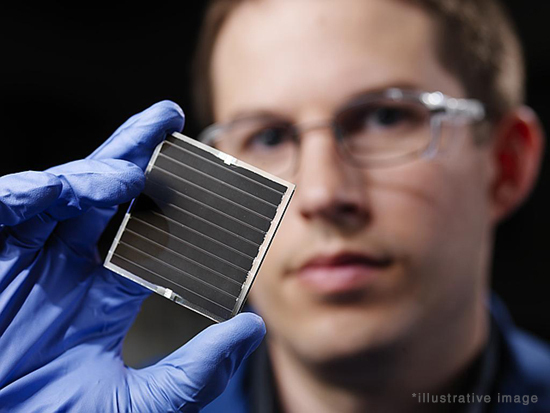 A recent report from Berkeley Labs describes how perovskite solar cells might one day attain their theoretical maximum 31 percent efficiency while still being cheaper to manufacture than silicon cells. The Berkeley researchers measured the conversion efficiency of individual grain surfaces using photoconductive atomic force microscopy. They found, to their surprise, that different facets have markedly different efficiencies, with some exhibiting the maximum possible. The researchers now believe that they can find a way to grow bulk films with only the most efficient facets interfacing with the electrodes. This could lead to the entire cell running at 31 percent. 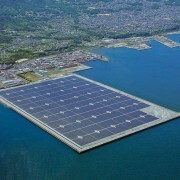 If this pans out, it would amount to a revolutionary advance in solar cell technology. 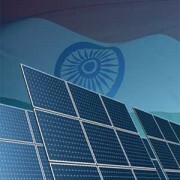 Research in photovoltaics is proceeding rapidly on many fronts. Some of these approaches are still in the early stages and far from being put into production, but they may become mainstream in the future. Making a solar cell with several layers is possible since the band gap can be tuned by adjusting the doping. Each layer would have a band gap tuned to a particular wavelength of light. These “multi-junction” cells can attain 40 percent efficiency but remain expensive. As a result, they’re more likely to be found on NASA spacecraft right now than on a terrestrial roof. The layering concept has been combined with perovskites in research performed by a collaboration between Oxford and the Institute for Silicon Photovoltaics in Berlin. While attacking the material deterioration problem that is a critical weak point of this class of materials, the team found that it had discovered a perovskite with a tunable band gap. The team was able to create a version with a 1.74 eV band gap, nearly ideal for layering with silicon. This might lead, after further development, to an inexpensive cell with 30 percent efficiency. 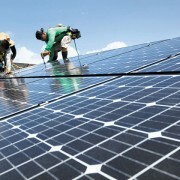 Groups at Notre Dame University and elsewhere have developed a photovoltaic paint made from semiconducting nanoparticles. The material is not yet efficient enough to replace conventional PV panels, but its manufacturing process is simpler. Among the advantages of semiconducting nanoparticles is how they can be applied by painting over a variety of surfaces. This makes installation potentially far easier than attaching rigid panels. A few years ago, a team at MIT made significant progress in the search to develop a practical solar thermal fuel. This is a substance that can store solar energy internally and stably over a long period of time and release it as heat “on demand” when exposed to a catalyst or some triggering heat. Solar thermal fuel accomplishes this through non-reactive transformations of its molecules. In response to solar radiation, the molecules are transformed into photoisomers: the chemical formula is the same, but the shape is different. The light energy is stored as added energy of the intramolecular bonds in the isomer, which can be thought of as a higher energy state of the original molecule. When triggered, the molecules snap back to their original shape, transforming the stored bond energy into heat. The heat can be used directly or converted to electricity with a thermoelectric generator, or heat engine. This idea potentially eliminates the need for batteries, as energy storage is integral to the system. The fuel can be transported if desired, allowing the energy to be used elsewhere. Since the work at MIT, which used fulvalene diruthenium, several laboratories are trying to solve problems with manufacturing and material costs in order to develop a system where the fuel is sufficiently stable in its energized state and can be “recharged” then used many times without deterioration. Just two years ago, the same scientists at MIT (along with others from that institution and from Harvard) created a solar thermal fuel that they demonstrated could be put through at least 2,000 cycles with no decrease in performance. Their innovation was to attach the fuel (in this case, azobenzene) to carbon nanotubes. This caused its molecules to line up in an orderly array. The result is a solar thermal fuel with 14 percent efficiency and an energy density similar to a lead-acid battery. More recent work has given birth to a solar thermal fuel in the form of a transparent film that can be applied to car windshields, where it can melt ice at night using energy absorbed during the day. The pace of progress in this area leaves little doubt that solar thermal fuels will soon make the leap from the laboratory to becoming a familiar technology. Another way to create fuel directly from sunlight (an approach sometimes described as artificial photosynthesis) has been developed by researchers at the University of Illinois at Chicago. Their “artificial leaves” use sunlight to convert atmospheric carbon dioxide into “syngas,” which is a mixture of hydrogen gas and carbon monoxide. Syngas can be burned directly or converted into more conventional fuels. The process has the added advantage of removing CO2 from the atmosphere. A team at Stanford has created a prototype PV cell using carbon nanotubes and fullerenes rather than silicon. Its efficiency is far below that of even ordinary, commercially available silicon solar cells, but it uses nothing but carbon as a raw material. The Stanford prototype contains none of the toxic materials that form part of the electrodes in conventional solar cells. It’s a more environmentally friendly alternative to silicon, but it still needs to see its efficiency rise before becoming economical. Meanwhile, research into other materials and manufacturing techniques continues. One promising area of research involves monolayers, layers of materials one molecule thick (like graphene). These result in PV materials that, while only a few percent efficient in absolute terms, are thousands of times more efficient than conventional solar cells per unit mass. 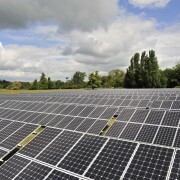 Other researchers are attempting to develop practical “intermediate band” solar cell materials. The idea here is to use nanostructured materials or special alloys to create a lower energy level that can be used as a stepping stone for photons without enough energy to bridge the band gap. This makes it possible for two low-energy photons to kick an electron into the conduction zone, something that is impossible with standard solid-state devices. These cells are potentially more efficient, since they can convert a wider range of wavelengths into electrical power. 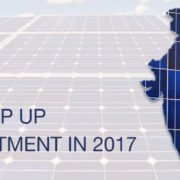 This variety of research in diverse approaches to photovoltaic cells and materials, and the rapid and steady progress since the invention of the silicon solar cell in 1954, inspires confidence that the enthusiastic adoption of solar electricity will not only continue but increase in the near future. And such efforts won’t come a minute too late. A recent meta-study concluded that PV power has exceeded the energy investment return of oil and gas: more energy is returned from solar power per unit of energy invested than for these fossil fuels—a dramatic turning point. There is now little room for doubt that solar energy will eventually be a significant, if not the dominant, form of power both on an industrial and an individual scale. So for the scientifically minded, one can only hope that the consequent reduction in the need to burn fossil fuels happens before the global climate suffers irreversible changes.